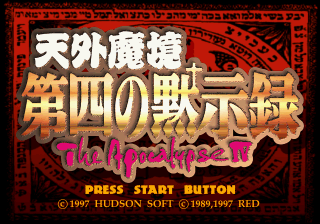 Tengai Makyou: Daiyon no Mokushiroku (天外魔境 第四の黙示録), also known as Far East of Eden: The Apocalypse IV, is a 1997 RPG for the Sega Saturn released in Japan by Hudson Soft. It is spin-off of Hudson and Red's Tengai Makyou (Far East of Eden) series. For many years this game was a Sega Saturn exclusive, however was remade in 2006 for the PlayStation Portable. Main article: Tengai Makyou: Daiyon no Mokushiroku/Magazine articles.